Apple upgraded its entire range of notebooks with the mid-2012 refresh. Although the 15-inch MacBook Pro with Retina display has grabbed most of the headlines, the entry-level 13-inch MacBook Pro shouldn't be overlooked. The two new 2012 13-inch MacBook Pros retain the same form factor used by the previous generation, which was released in late 2011. Once again, we get a unibody enclosure milled from a single block of aluminium. This is far stronger and lighter than if it were built from separate parts. The LED backlit screen is the same as before, as is the 720p FaceTime camera that sits above it. Just the thing for video calls. Apple's famous backlit keyboard is retained too. When the light dims, the keys are automatically lit to aid typing. You can dim this backlight if it's too strong, or switch it off altogether if (for example) you're watching a movie. But although from the outside they look exactly the same as before, the 2012 13-inch MacBook Pros offer significant improvements over the 2011 laptops under the hood. The processors have been upgraded. Although the speed bump is very small - 0.1GHz on each model - the new CPUs are Ivy Bridge chips, the third generation of Intel's Core i series. These processors have significantly better integrated graphics than their late 2011 predecessors. Since the 13-inch MacBook Pros' logic board is too small to house a discrete graphics processor, this is a very important upgrade. The top-of-the-range 15-inch MacBook Pro with Retina display made a few sacrifices for the sake of portability, losing its optical drive to make it lighter, dropping a couple of connectivity ports that were too big for the ultra-thin body and swapping the hard drive for solid state storage to reduce both bulk and weight. But the two new 13-inch MacBook Pro models stay faithful to the regular MacBook Pro design. The 8x SuperDrive for reading and burning CDs and DVDs is retained, as are the FireWire 800 and Gigabit Ethernet ports. The single Thunderbolt port introduced last year is also retained, as is the SDXC card reader. Once again, the 13-inch MacBook Pros have two USB ports, but these are now USB 3.0. Storage is still via a hard disk drive, at least in the standard, off-the-shelf computers. The cheaper of the two 13-inch MacBook Pros costs the same as before; this entry-level 2.5GHz MacBook Pro is still £999 in the UK or $1,199 in the US. 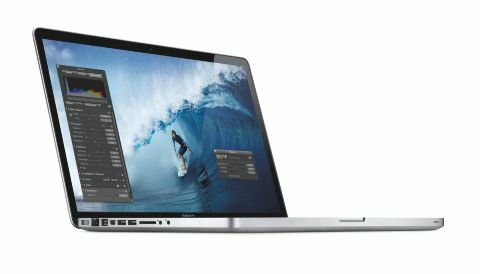 The pricier 13-inch 2.9GHz MacBook Pro has actually got a little cheaper, selling for £1,249 or $1,499. Like all Macs, the new MacBook Pros come supplied with the latest version of OS X, which at the time of writing is 10.7 Lion. If you buy before the release of its successor Mountain Lion, which is due in July 2012, you can claim a free upgrade. Apple's acclaimed iLife suite is also included; edit your videos with iMovie, make music with GarageBand and organise your digital photographs in iPhoto.